The Ematic Quadcopter Drone with HD Camera makes flying simple. Record stunning HD videos while flying. Perform flips and rolls with the press of a button and fly from up to 260ft away. The 6 axis gyroscope ensures a stable flight. 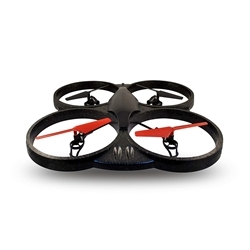 Safely fly the Quadcopter inside or outside thanks to the durable, lightweight design.